This is a bit of prog archaeology on the part of Musea. See, for a good long while Neuschwanstein were seen by much of the prog world as one-album wonders, with only the Battlement release to stand as evidence of their existence. 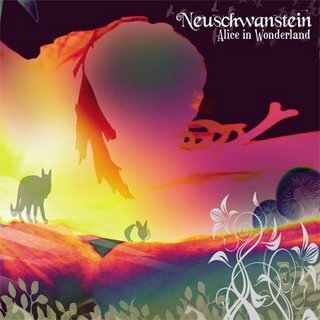 However, the lucky few who had seen Neuschwanstein live back in the day knew that there was more to it than that - that they'd also developed a conceptual stage show based around the classic Alice In Wonderland story, and had indeed first come to the notice of the German prog scene by winning a competition with this creation. This album consists of demo recordings made in 1976 of the music and narration of the stage show. Much like Happy the Man's Death's Crown or Soft Machine's Spaced, then, this is an archival release of material originally intended to accompany a visual performance on stage - and as with those releases, it's a little flawed as a result. Listeners will likely find the recording quality very frustrating; there's clearly some very nice Genesis-esque pastoral prog being played here, but with that appalling background hiss in the way it simply doesn't sound as good as it might have had it been recorded to a professional studio standard. And the occasional narration breaking up the instrumentals is a bit obtrusive and hurts the flow of things. Uiltimately, listening to a piece like this you are only getting half the picture; like the albums I've mentioned (or, for that matter, Pink Floyd's The Wall), this was created with a particular visual experience in mind, and without those visuals the material is somewhat hampered. On top of that, the recording quality just cuts the album's legs out from under it. It's a testament to Neuschwanstein's talents that it still sounds pretty good despite all that, but this is very much a shiny curiosity rather than a long-lost classic.